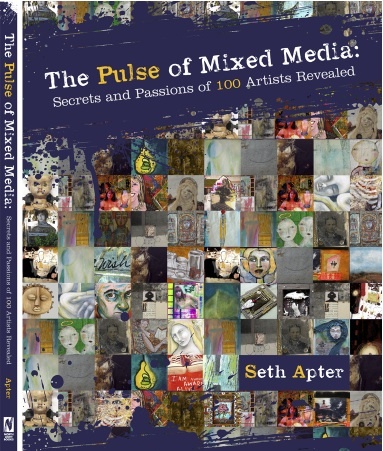 I am proud and excited to be a part of Seth Apter's first book - The Pulse of Mixed Media. I've followed Seth's blog for years, participated in his online Pulse and his Disintegration Project. I have always been amazed at his insight, his creativity, and the selfless way he promotes the mixed media community. If this was a barn-raising, Seth would be in charge, and we'd all be relieved he was here. For my contribution to The Pulse, Seth asked me to create a project based on this question: What is your current art obsession? Bookmaking is my current -- and probably forever -- obsession. 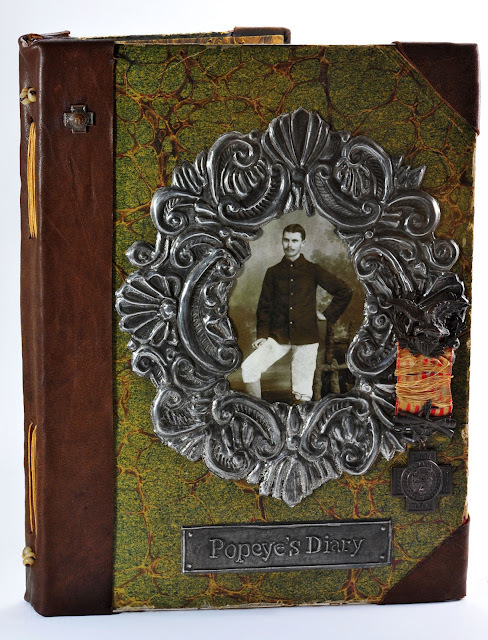 The project I submitted was built around a found diary that my great grandfather kept while stationed in the Philippines during the Spanish-American War. 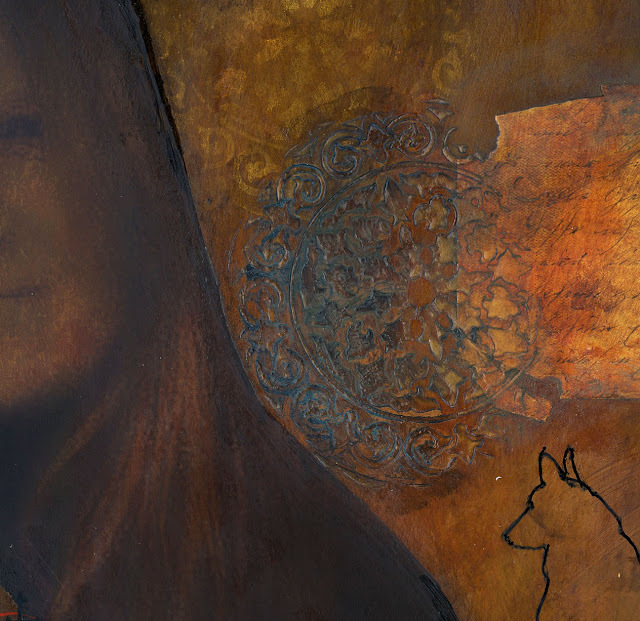 This is a portion of the self portrait I added to the book, titled Ever Rooted, Ever Growing. I had the pleasure of meeting Seth in person in 2009 and again in 2011 when we bound books together. Continuing the theme of Taking the Pulse, I asked Seth if he could remember when he first thought of himself as creative. I actually do recall a specific event when I thought I might be creative. I was four (or maybe five) and had drawn a duck. I showed it to my best friend, Tommy, who lived next door. "Huh-uh," she protested. "You did not draw that; your mom did." I actually dabbled in many creative endeavors in high school, college, and as a young adult...although never the visual arts. From that perspective, I think I knew that I had a creative side. But until I connected with bookmaking and mixed media arts in 2000, the adjective 'creative' would not have been one of the first I would have used to describe myself. But I think as I became more and more active in and engaged by art, I slowly began to get in touch with my creative side more and more. Oh, and Seth, another question: There's a spot on the back half acre that could use a barn . . . or at least, a garden shed. Think you could rally the neighbors? I really like your self-portrait. Now I'll go check out the book! splendid stuff. i'll bet Atticus and Scout are very proud. even if you did begin with a duck drawing. Hi Leslie, congratulations on being included in Seth's book. I love the books you've created to bind your memories together - wonderful work! Hi Leslie, great to meet you via Seth, and ongratulations on being in The Book. Can't wait until my copy arrives. 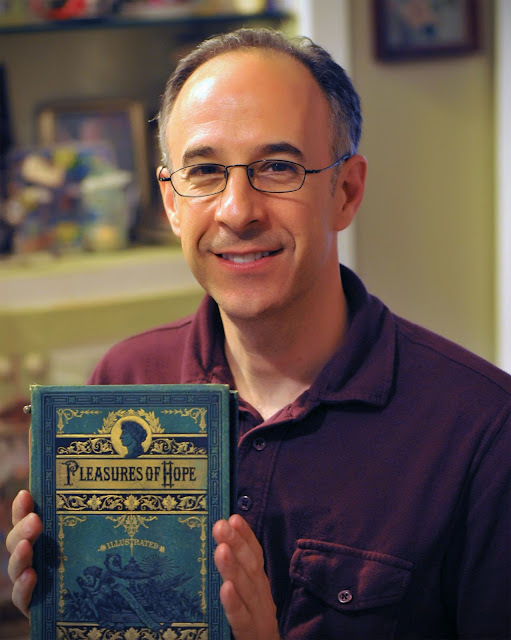 I very much like your work, and being a book binder/ book artist myself I love to see what you've been making. I will enjoy visiting you again. You know I love your books - they are made to perfection. In fact any artistic medium you work in is always mastered by you. What a wonderful choice Seth made! I look forward to reading your entries in the book. It's great getting to meet you through Seth's book and blog. I loved your self portrait, especially the tones and colors. What beautiful books you've created- and with such special meaning to you. What a treat that you've worked with Seth, both in taking a course together and from him taking a course from you! Love learning so much about everyone from this 31/31 series. I've received the book and your self-portrait in its entirety is super! So glad that you've been spotlighted! I have really enjoyed looking through your blog- really lovely work. Browsing through your blog and loving your amazing photographs. Your self portrait is beautiful! Yes, if anyone could rally the neighbors Seth COULD! Seth CAN. Seth DOES!!! Your books are stunning and that word is not justice enough! How I would love to look inside your grand father's journal book. Once again I feel so lucky to meet yet another artist from The Pulse of Mixed Media. What treasures you all are! Thanks so much Leslie for being a part of my books. I needed to have book arts represented and I thank you for being such a talented and creative representative. Amazing! I saw your books on Seths blog and had to visit. Wow, so glad that Seth featured you on his blog today. I love your books. Amazing work! Your books are beautiful. I can't think of another word for them. Thanks to Seth for bringing me here. What treasures books are and you do have some very lovely treasures. What lovely books you have made!! I love to make my own books also. What an amazing post and wonderful question. I am SuRE Seth would help raise that barn. All he'd have to do is ask and we mixed media artists would be there, if only via blogland!! all your posts are magical.....just joy to sit and marvel at the colors in your photographs, the details in your books, the dreaminess of those baby snaps. Wow, you have mastered book making. They are treasures. Also love the newborn photos. Divine! Had a great time on your blog. Congrats on being featured in Seth's book. I was so pleased at Seth's feature about you on his blog. And I come over here, and you're making me smile and giggle. I can't wait to see you again. I wish I could walk over and share some tea/coffee/tequila. You are delighful to me. Oh Leslie, I am in awe of you and your creations too! And someday I hope, (like Chris! ), that I can join you for tea, coffee or tequila! If by chance you feel better when I am in your area... maybe there is a chance?!?! Congratulations Leslie...well deserved. As you know, I am big fan of yours. Can I say "I knew her when"? Congratulations Leslie your work is truly inspiring. Great book and there couldn't be a more deserving person to be part of it, Leslie. You are an amazing artisan, and everything you touch turns to beauty with soul!